Valencia boss Gary Neville says he is remaining calm and focused despite failing to win any of his nine La Liga games since taking over. Neville's side are 14th, four points above the drop zone, before Saturday's visit of Espanyol (19:30 GMT). But the ex-England defender said: "I haven't seen the players panic and they've not seen me panic. "There can be a hurricane on the outside but you have to be in the eye of the storm on the inside." 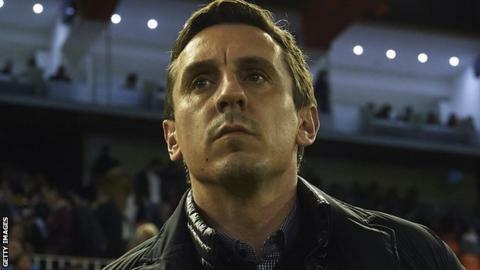 Neville, 40, has come under increasing pressure, with former Valencia captain Santiago Canizares telling him to quit. Valencia, who finished fourth last season, have lost four and drawn five league games since Neville was appointed at the start of December. Last week's embarrassing 7-0 first-leg defeat at Barcelona in the Copa del Rey semi-final led to Canizares demanding his resignation. "There's been no huge sway to behave in a different way the last few weeks of results," Neville added. "We've not changed tack, we've not changed the way in which we work. We believe in our work and proving ourselves. "We have to win against Espanyol and that's what we're focusing on. It's a final." Espanyol are fourth-bottom in the Spanish top-flight, three adrift of Valencia before Saturday's meeting at the Mestalla. And Neville has urged Los Che fans to get behind his team after only 10,000 showed up to Wednesday's 1-1 second-leg draw against Barca. "I am grateful to the fans who came out to support us," added Neville. "Those who didn't want to come are within their rights. "Mestalla will be full on Saturday, and the atmosphere will be electric. "We need the fans more than ever on Saturday."